Welcome to Monson Construction, Inc.
Monson Construction is a full service general contractor located in Murray, Utah. 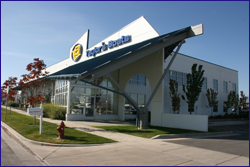 We provide commercial construction services to businesses and government buildings in and around Salt Lake City. We’ve worked on hundreds of warehouse and distribution facilities, office buildings, retail stores, restaurants and government projects. If you are in need of general contracting services, take advantage of our builders’ knowledge and expertise. For more details on our work, please read about our Commercial Building Projects or view our Construction Gallery. At Monson Construction, we promise quality products, affordable prices and great personal service. The relationships we’ve formed with our clients have resulted in repeat business and countless customer referrals. If you’re looking for a reliable commercial contractor, call Monson Construction today. Provide a quality product at a competitive price. Conduct business such that our clients will have confidence in our ability to provide them with an excellent product. Provide clients with realistic timetables and cost estimates and complete projects on time. Treat employees, subcontractors and clients with respect and dignity.